I'm so excited for the winner of this contest, I can barely stand it. Not only is it a super cool gadget (and expensive at that), but it will help reduce her plastic and/or glass usage tremendously. Congratulations, Courtney!!!! Please email your contact information to crunchychickenblog@gmail.com. 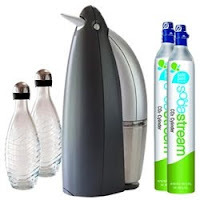 Congrats courtney--- you should have many happy years with the soda stream... have fun inventing new drinks! Damn. Another one that I didn't win. Next time you have a contest I think that you should limit the entrants to people named Bucky.